Update: I bought the machine. If you have the iphone, make a separate album with the photos you want to show. Click on one of the pictures, then the arrow. It says "Start Slideshow." The machine will work with the phone's slideshow setting. It's awesome. I was helping a friend plan a birthday party for her husband. Since this person does NOT want to celebrate one of his major milestones, we were trying to come up with alternatives. He did agree to go to a restaurant we all like. But...his wife and I wanted to have some kind of a surprise for him. Brookstone sells the machine in the picture above. 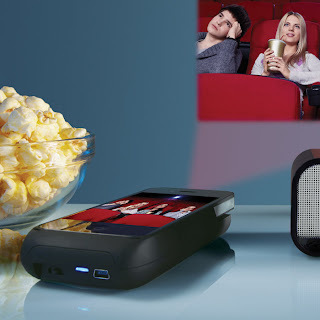 It is a tiny projector that your iphone slips into. I made them demonstrate it for me before Christmas, as I wanted to give one to my son. Even under the bright lights, it worked fairly well. He has since told me that he has downloaded videos to his iphone and showed them to friends on the wall. So...I called the friend to ask her to accumulate photos of said husband. She is going to scan them into the computer. They will email them to me. I will open and save them to my iphone. Then....at the restaurant...I will proceed to show them on the wall with my projector. (I've wanted a reason to buy one for myself). Another idea for the use of this machine. Interview friends of the birthday person. Take a movie on your iphone of each person wishing them well. Project these wishes also. I can't wait to use this technology to try to surprise him.